At the electronica 2018 event, ON Semiconductor, will be showcasing their ultra-low-power IoT solutions featuring new IoT prototyping platforms based on the RSL10 radio SoC. Two most recent additions to the portfolio of IoT platforms include the Bluetooth IoT Development Kit (B-IDK) and Energy Harvesting Bluetooth Low Energy Switch. Demonstrations will cover mesh networking, battery-less edge nodes, and the latest audio and vision solutions powering Artificial Intelligence (AI) at the edge. The RSL10 is the industry’s lowest power Bluetooth Low Energy SoC, consuming just 62.5 nanowatts (nW) in sleep mode and only 7 milliwatts (mW) when receiving. 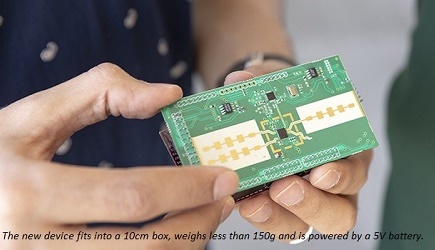 It integrates an RF transceiver and Arm Cortex-M3 microcontroller, offering a single-chip solution for developing intelligent and connected IoT edge nodes. As the industry’s lowest power Bluetooth Low Energy solution, the RSL10 can enable edge nodes that are able to operate purely from harvested energy, creating new possibilities for totally battery-less, maintenance-free, connected IoT edge nodes. The recently released B-IDK is a modular platform for developing and prototyping Bluetooth Low Energy applications targeting the IoT. It brings together the RSL10 with a range of sensor and actuator modules for rapid development, along with a companion mobile application to provide instant cloud connectivity. This provides an ‘out of the box’ Hardware to Cloud solution that is ready-to-use and fully supported with sample software. ON Semiconductor’s booth at electronica will include four IoT demonstrations highlighting new use-cases of the RSL10, including a Bluetooth Low Energy Mesh Networking demonstration featuring the RSL10 Sensor Development Kit. This showcases the enablement of many-to-many connections using a combination of the lowest power Bluetooth Low Energy, sensor, and mesh technology. Other demonstrations include battery-less and wireless edge nodes implementing Bluetooth Low Energy, Zigbee, and Green Power, all powered by energy harvested from motion and solar sources. Within Vision IoT, the company will showcase a machine vision camera incorporating cutting edge image sensors and a Power over Ethernet (PoE) transceiver. In addition, visitors will learn how ON Semiconductor technology is being used to add Artificial Intelligence to IoT edge nodes to detect and react to audio commands using natural language processing.